Excellent post and I am going to think a little more on some of the add packs and how I handle them now. Loved Rogers comment, sometimes I'll just let the warrior finish them off. Our boomkin is not a regular. The ideas here will work wonders in the organized raid environment but in the pug world I would have to wonder if it would be the best idea to do the "right" thing instead of whoring the meters. Just asking that questions shows the sad state of pugs sometimes. But many raid leaders look at numbers and numbers only. They might not notice that you are doing your "fair share" on the adds but top damage on the man at arms because, just perhaps, your damage done over all on the fight is lower than the hunter that had a massive thrill proc and went multi shot crazy on a huge pack of adds. There really is a question hidden in that shot I took at pugs. Is multi shot spam really "that" much of a difference, or is it close enough that you can do the "right" thing and still keep up with the whores with all things being equal otherwise? Everything is situational. As you mentioned. If you have no boomkin (or warrior in my case) to finish off the adds, you might need to do it, and if you are in a "suspect" pug you might need to pad to stay in it. But this is really something I think I am going to play around with some. Maybe put a little deeper single target into my AoE. Thanks for the great post. Yeah, that kind of came up on twitter, too. If you don't have an enrage timer you're trying to beat, in normals or heroic, but you're with a less skilled or geared tank who maybe isn't mitigating as much as they could, then it might be better to just spam AoE to keep the tank alive, then deal with the boss in between add phases. As for how close it is, I don't think it's huge. I haven't looked at enough numbers to really say one way or the other, but my gut feeling is that this is a strategy for people who are progression raiding, with a set raid team. I would guess in most pugs, most people have already downed the content. And if that's not the case, they're doing an easy enough level of content that being this particular isn't too important. 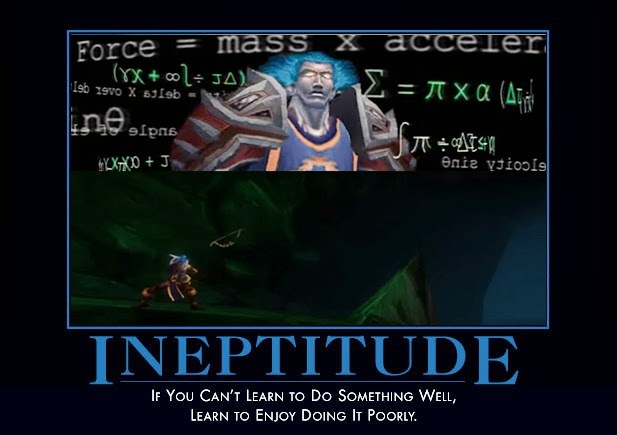 We did a highmaul gear run for a couple of new players last night, so at the beginning of the night I told myself I was going to practice this, no matter where it put me on the meters, I'm going to let my dots do their work and focus on the priority. It is hard, for someone like me at least. When I start to see my name dropping down (because others are free to whore the meters, this being old farm content) it's so tempting to give up and just focus on meters. It's gonna take me a while to retrain my brain to not think of higher meters as a reward. I tried to do that last night as well and kept failing at it. "Its only trash, why not". But a few times I did focus on one target and let the DoTs work, it actually did not seem that bad. Of course doing it that way always worked better on smaller groups. I guess the idea is for us to find the number. The let the dots do the work thing seems better on smaller packs, up to even 4 maybe 5, but once you get that huge pull, I am thinking multi spam might be better. Even more so if there is not a center target to worry about. I've always, even before I read this, put black arrow on a priority target that I knew would last, and did the multi spam and used explosive procs and refresh of BA on the main target only. That seemed to work well for me when there are a lot or a little butof stuff to kill. Perhaps that is the appropriate way to go and I was just doing it by default to begin with because it "felt" right. Hey, sometimes feel is the best way to figure things out. This conversation came up in my guild several times during the last couple of weeks with regard to H-BRF progression (not to mention countless threads about thee BM bandwagon). I'm no stranger to holding opinions that seem to clash with what appears to be majority opinion (hello focusing shot MM) and this isn't an exception with regards to the pressure brought on by my fellow officers about switching specs to BM. Nevermind the opposing stat priorities between MM and BM, there's obvious value is having amazing single target DPS for the boss and/or priority targets. This is, of course, something that needs to be taken into context with the raid team one has, not the raid team one wishes for (my guild can't find a balance Druid, a competent warlock or combat rogue). That, I think, is key. Let the classes that can efficiently cleave do their job. Marks brings burst on 2 minute CD and a 35% execute, those two alone are valuable assets to a raid team. That's a great point. Maybe it needs an article of it's own: strategize for the raid team you have, not the raid team you wish you had. I played around with some offset gear that I picked up as BM for last weeks raid (I do have the 2 piece bonus). The numbers were, somewhat to be expected I suppose. Did about 10k more overall damage on Thogar, slight increase on Flamebender and Darmac (bad positioning on the adds). That's probably more a result of mediocre BM play. That and the 180 of stat priority (going from next to no mastery to a few pieces with it made a huge, huge difference) means I would need almost two sets of gear. I believe I am going to continue to stick primarily with Marks spec. Perhaps BM would see more use on blast furnace but that's going to take a few pulls before I get to discover what my raids weaknesses are for that encounter. Well, got a few pulls in on H BF and it didn't go so well with my small raid team. 2 healing an 11-12 man raid with an ilevel average of 680 isn't doable even with myself as BM, 2 survival hunters and 2 ret paladins (did I mention we haven't found a competent demo/destro lock, combat rogue yet?). It looked like we'd stay ahead of adds, keeping heat low, for the first two waves, then it just seems to spiral out of control and neither healing or DPS can keep up with the adds that start to pile on. Eventually we'd push into phase 2 at a decent time and then a tank would die followed by a wipe shortly thereafter. I suspect it's a combination of strategy, needing at least one or two healers and more DPS, aka increasing the raid size to 15-20. A lot of guilds on my server are currently stuck at 8/10 H with BF and BH to go. This week we'll be teaming up with another guild for H BRF, guess we'll see how it goes. An excellent post and I'll reevaluate how I use my aoe abilities from now on. From my own experience, I've been so focused on doing as much aoe damage as possible to prove that I'm a good Hunter and worth my raid spot that I failed in doing damage to the targets that needed it most. Yeah, that's kind of the dangerous part, as The Grumpy Elf pointed out above, if you have a raid leader who's not too bright, they may just see high dps and think that's the best player, or even cut someone. Hopefully you have, or can find, a raid team where that's not the case, though. Very hard to get used to. And then you switch spec from Survival to BM and forget that there is no longer a DOT!! Or vice versa. I don't see any getting around the DOT clipping altogether. Unlike DPS, heals actually show up on the healthbar before you finish casting (so you have an idea how much it will move). Could you imagine the healthbar of the victim showing a theoretical damage amount or an add-on that could do this? No more wasting time, you dish out the DOTS and see if that is sufficient with the "theoretical damage" and move on. EFFICIENCY!! But alas, there is no efficiency in WoW. They want us to mindlessly grind. Why else would you have had to travel the old world to learn how to use a water totem (I know, that quest is gone, but I still remember it vividly. You turn level 20 and they send you around the world. Then you hit 30 and BOOM! 60 minutes of RED-SKINNED AWESOMENESS! But since you didn't know this, you didn't plan around it, it was wasted. Didn't I mention that they don't want us to be efficient? ).